Disney Diary - Week 24. With my Disney life out of the way, now finally comes the parks themselves. 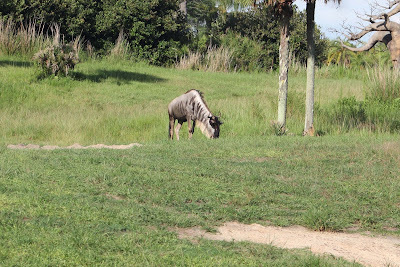 My first trip to a Disney park began with Disney's Animal Kingdom. 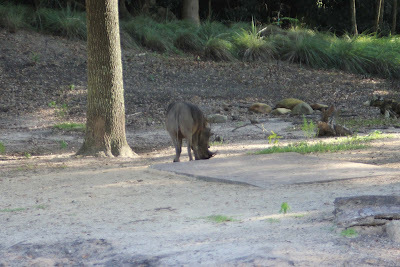 Located within the Walt Disney World Resort in Bay Lake, Florida, southwest of Orlando. It was dedicated and opened to the public on Earth Day, April 22, 1998. It is the second largest theme park in the world, behind Six Flags Great Adventure in Jackson, New Jersey, and it is the largest Disney theme park in the world, covering 500 acres (200 ha), It holds the distinction of being the first (and only) Disney park to be themed entirely around animal conservation, a philosophy once pioneered by Walt Disney himself. 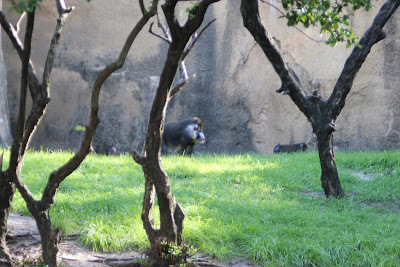 The Association of Zoos and Aquariums and the World Association of Zoos and Aquariums, meaning they have met or exceeded the standards in education, conservation, and research, accredit Disney’s Animal Kingdom. In 2014, the park hosted approximately 10.4 million guests, ranking it the fourth-most visited amusement park in the United States and seventh-most visited in the world. 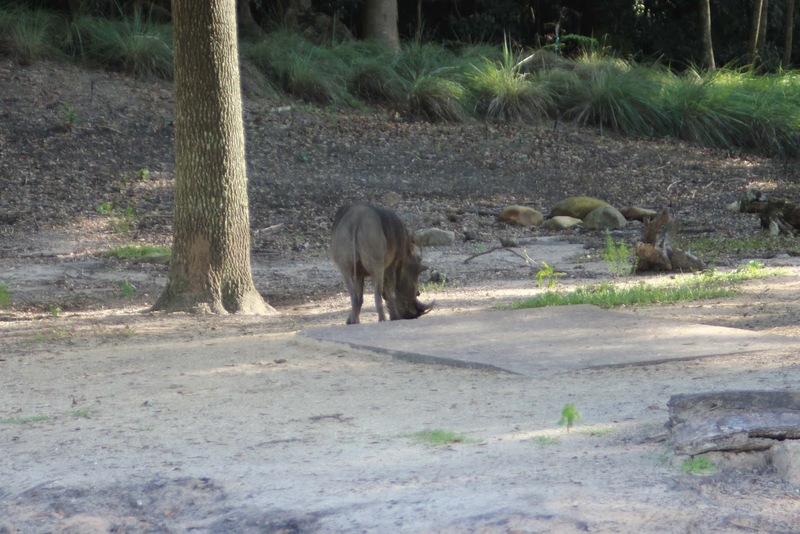 So now, I officially (or officially) welcome you my dear readers to Animal Kingdom! As I will recount my memories of that day, as well as my knowledge of the park itself. The park itself is represented by this great monument known as The Tree of Life. A sculpted artificial tree that stretches to 145-foot-tall (44 m) and 50-foot-wide (15 m) . Here we come to Expedition Everest. Here you can embark on a thrilling expedition through the icy peaks of the Himalayas, home to the legendary creature known as the Yeti. Like most of the Disney rides, this ride has a story to go along with it. The story is based around Himalayan folklore. It has it that a fierce guardian monster protects the Forbidden Mountain. For years, the Royal Anandapur Tea Company shipped its tea by train through the Forbidden Mountain pass. After a series of mysterious accidents were blamed on the dreaded Yeti monster, the railroad closed. Today, the railway is operating again, thanks to a group of local entrepreneurs—Himalayan Escapes, Tours and Expeditions— who offer curious travelers transportation to the base camp on the scenic mountain. Yet there are some who believe the legend to be true and that the Yeti will do everything in its power to protect the sacred realm of the Himalayas. Visitors beware. The Venture begins inside a Tibetan-style stone structure at the foot of towering Mt. Everest and make your way past the booking office of Himalayan Escapes – Tours and Expeditions. Wander past a small temple and a cozy general store before exploring a museum dedicated to the study of the Yeti, the mysterious snow monster said to inhabit the Himalayas. The ride begins as you board a weather-beaten train and ascends a series of rolling hills overlooking a serene green forest. Climb a steep incline and navigate through a ceremonial stone tunnel before reaching the summit. Once at the “top of the world,” hold on tight as you pick up speed and race inside the dreaded mountain. Without warning, your train screeches to a halt: A broken and twisted track appears in front of you. Brace yourself as your train unpredictably begins to race backward into the darkened mountain, furiously swooping up into a double-looping turn. Inside the windswept passage, the shadowy figure of a growling creature can be seen on a cavern wall. It is the Yeti—the legend is real. Then you hurl 80 feet down the base of the cursed mountain and swoop in and out of murky caves and along jagged rocky ledges as you race to escape the dreaded monster before he catches up with you. Here we enter into Dinoland. A dinosaur themed carnival full of rides and other wonders and fun. Now, we come to the Dinosaur Ride. Based on the 2000 Disney movie. Travel back in time on a perilous race to rescue an Iguanadon before the meteor that wiped out the dinosaurs strikes. The ride begins as you step inside the halls of The Dino Institute, a one-time secret research facility and museum that is home to real fossils dating back to when dinosaurs walked the earth. During narration provided by Bill Nye the Science Guy, stroll past prehistoric exhibits and behold the colossal skeleton of the carnivorous Carnotaurus, one of history’s most feared dinosaurs. You then make your way into the research control center and watch an informative video about your adventure into the primeval past aboard the CTX Time Rover—your vehicle for the trip back in time. The presentation takes a turn when you're recruited to rescue a mild-mannered Iguanodon from extinction and return back to the present with the 3.5-ton dinosaur. There’s just one problem: The date you're being transported to is around the same time that a giant meteor hit the Earth and caused the extinction of the dinosaurs. Then you board a sturdy, 12-seat Time Rover and race through a darkened forest in search of the tagged dinosaur. You'll experience the world, as it existed 65 million years ago! Speed past a spiky Styracosaurus grappling with a nearby tree. Brace yourself as you careen through unpredictable hairpin turns, a ragged Alioramus foraging for food nearby. Dart around a fearsome Velociraptor hunting for prey and avoid the clutches of a Cearadactylus soaring overhead. As the countdown clock ticks, meteors crash all around you: The end is near. Suddenly, the terrifying roar of an unimaginably huge beast can be heard in the distance. Is it the friendly Iguanodon you’re searching for—or the dreaded Carnotaurus looking for a meal? This skeleton is a real skeleton of a female Tyrannosaurus Rex. Now we enter into Africa! 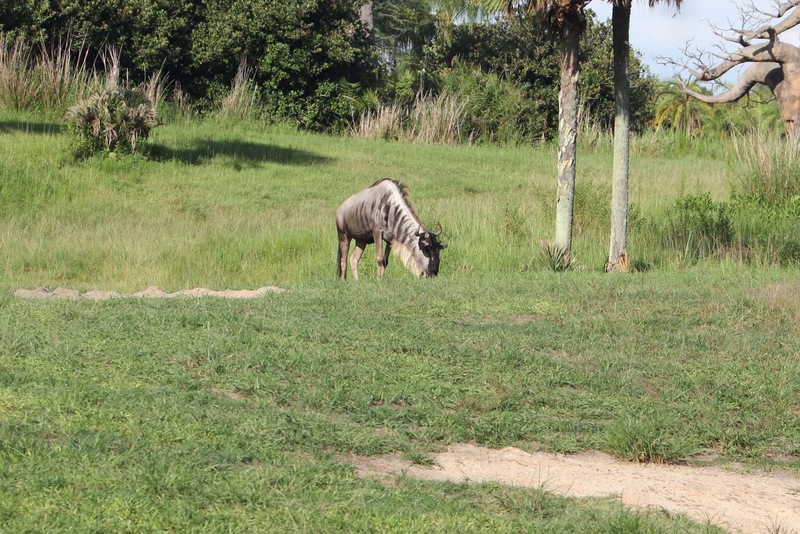 Now, onto my favorite ride, Kilimanjaro Safaris. Undoubtedly, the best ride in Animal Kingdom. As you get to go on a personal drive through the various landscapes of Africa without actually going to Africa. But yet witness the same kind of wildlife that you'll find there. Glimpse real animals in their natural habitats during an 18-minute expedition into the Harambe Wildlife Reserve. 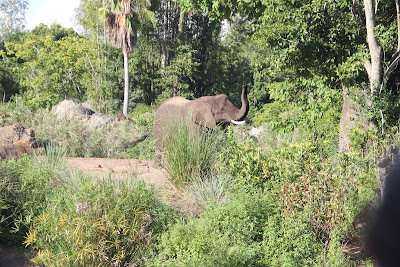 Traipse along a twisting path amid a lush garden gateway and make your way to the rendezvous point of Kilimanjaro Safaris expedition, the touring company for your adventure into the wilds. Featuring picturesque open plains, shady forest landscapes and rocky wetlands, the 110-acre Harambe Wildlife Reserve is a spectacular sanctuary dedicated to the protection of African animals. Climb aboard an open-air safari vehicle and hang on tight as you take off on a guided tour into the African outback—where over 34 different species of exotic African wildlife seemingly roam free. As your bumpy transport makes its way through rugged terrain, glimpse an array of exotic animals in a variety of unique habitats, your helpful guide providing you with valuable information during the journey. Spot a shy hippopotamus nestled beneath a still pond. Behold a regal lion sunbathing on a rocky perch. Drive past a gentle giraffe grazing on a tall tree. Wave hello to a resting rhino. Since animals have minds of their own, every Kilimanjaro Safari expedition is a unique and unforgettable experience. Some animals you may encounter during the tour include: Antelopes, Mandrills, Black Rhinos, Cheetahs, Crocodiles, Elephants, Flamingos, Gazelles, Giraffes, Hippopotamus', Lions, Okapis', Ostriches, Warthogs, White Rhinos, Wildebeests and Zebras. I managed to capture most of the animals listed here. Hope you enjoy the photos below. Lions. One of them is actually named Simba. Here, sadly, comes the end of my adventure. What can I possibly say? It was unlike anything I have ever seen. And I'm sure that I will return to explore further as it has reignited my thirst for nature and all of its wonders. And I would like to thank my roommate Hermmann Lopez and his lovely set of female companions for taking me with them to see all of what I have told you. Film Review: "Inside Out" (2015). Disney Diary - Week 22. Film Review: "Jurassic World" (2015). Disney Diary - Week 21.